Credit: www.pixabay.com. CCo Public Domain. For a long while people have used the phrase ‘climate denier’ or ‘denialism’ as pejorative labels to admonish those who reject the reality of climate change. Whether it’s industry-funded disinformation spin doctors or members of the public who are perceived as dupes for believing that climate change is just a hoax, anyone who rejects the assertion that human-produced CO₂ emissions are dangerously altering the Earth’s climate system is frequently labeled in this way. But a curious thing has happened over the past few years: the use of ‘denial’ has expanded to include people who do accept established scientific evidence about climate change, but who nonetheless devote little personal time and energy to engage with the issue through activism or changes in their daily habits and routines. This growing concern with ‘our’ denial as opposed to ‘theirs’ has spawned a fair number of books and academic studies that seek to explain why people’s concern about climate change so often fails to translate into action. Kari Marie Norgaard’s Living in Denial is a good example. In this context, the meaning of denial typically suggests that a number of ingrained psychological coping mechanisms are preventing people from taking action even though they understand the consequences. 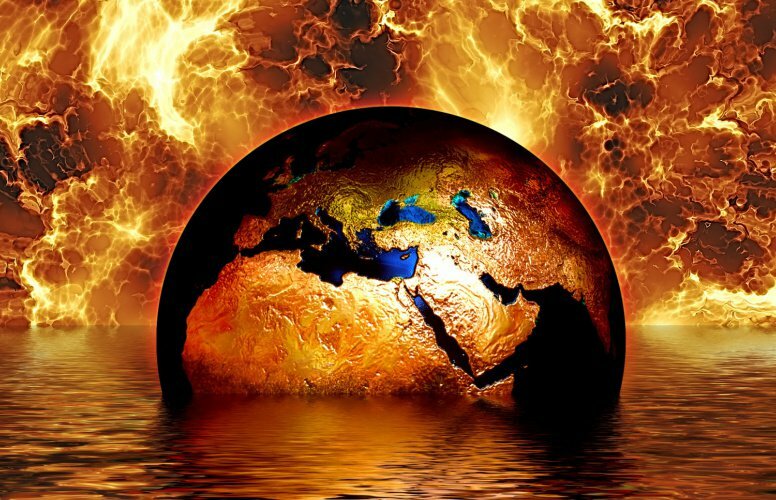 The imminent danger of climate change is, it seems, so unsettling that many of us unconsciously push reality to the backs of our minds so that we can get on with our daily lives and pretend that everything is fine. Simply put, we find ways to avoid feeling the fear that would otherwise compel us to act. These assumptions about what science and fear can achieve politically are widespread in the climate movement. Whether denial is applied to ‘us’ or ‘them’, the underlying belief is that a better grasp of scientific facts and a sufficient level of dread—if spread widely enough—will cause people to agree on some course of action. If only conservatives would stop denying the science, and if we could all muster the courage to face the terrifying calamity that lurks on the horizon, then finally we could come together through a mutual sense of self-preservation. This is the power that catastrophism exerts over public and political thinking. However, even a cursory review of the positions advanced by the different groups who are sounding the alarm reveals that, although anxiety about climate change can certainly generate political responses, it does so in remarkably different ways. For some, continued economic growth and climate mitigation go hand-in-hand, while for others ‘de-growth’ is the only way to avert catastrophe. Some argue that effective climate mitigation can occur within the confines of capitalism, while others insist that getting rid of capitalism is the only way to overcome the crisis. For some, rapid technological innovation and intensifying the processes of modernisation are essential, while for others an overly-optimistic faith in technology and progress lie at the root of the problem. Has the situation become so dire that we need to consider geoengineering our way out of the problem, or is this ‘Plan B’ too dangerous a gambit? It’s clear that even climate activists don’t speak with one voice. So while it’s reassuring to believe that science and a sense of dread will compel different groups to come together under the same political banner, this is highly unlikely. Fear of catastrophe is an affective state, not a world-view or a strategy. The meanings that people ascribe to climate change—what they believe is at stake, who’s responsible and what’s to be done—will always be interpreted through their own ideological lenses. To be sure, basic goals like keeping the average temperature of the globe from rising two degrees Centigrade above pre-industrial levels, or demanding an 80 to 90 per cent reduction in global CO₂ emissions by a certain date, are easy enough to agree on—the ratification of the Paris climate agreement by China and the US last week is a good example. But when it comes down to the gritty questions of how to accomplish these things people usually part ways, and often bitterly. The idea that catastrophism can create a political consensus and that ‘denial’ is the key barrier to progress clouds our capacity to recognise how great a hurdle these divisions represent. Is it possible, therefore, that concerns about ‘our’ denial reflect a creeping awareness that inducements to fear can’t accomplish what’s commonly expected of them? If so, what’s the alternative? In my view the primary focus of climate change activism needs to shift from highlighting imminent catastrophe to focusing on how to overcome political divisions—barriers to action that are conveniently ignored because it’s assumed that the policies needed to address the crisis are obvious once people acknowledge the basic facts. The highly generalized rhetoric that marks out many demonstrations and climate marches is symptomatic of this problem, with slogans such as ‘Act on climate change’, ‘Stop climate chaos’, and ‘Climate justice now.’ Actual policy proposals—the how-to of the matter—are rarely the centrepiece of the action. Obviously, street protest and detailed policy-making are different and complementary processes, and persuading millions of people to rally around anything specific is going to be extremely difficult. But grappling with questions like these requires devoting much more time and energy to foregrounding the disagreements that exist between climate campaigners and figuring out how to bridge or reconcile them in practice. As counter-intuitive as it may seem, one approach to this problem would be to stop using the threat of averting a catastrophe as the main incentive for a reformed energy system. A more unifying and productive discourse could emerge, for example, if the primary end-point for decarbonization were to be re-framed as empowering people by having cheaper, cleaner and more abundant forms of energy. This would place contested political values rather than risk mitigation at the centre of the debate, and might even resonate with people who don’t identify with environmental activism. An end to catastrophism as the key motive for creating a low/non-carbon energy system would aid this process by shifting the focus away from ineffective and often paralysing appeals to fear and dread, and re-orienting the conversation towards the many ways in which different groups can act, alone and together. We need to confront this particular elephant in the room and soon, or else we really are all in denial.